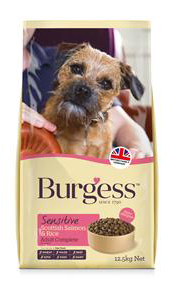 Unlike some well known brands, Burgess actually make their own pet food up in North Yorkshire, as well as making for other folk. When you look at the range on offer, it becomes clear that Burgess are trying to be all things to all people, as some of their foods could rightly be described as basic, whilst they also try and cater for those who want a more natural and digestible food. This can be a bit confusing for the consumer as there is not a lot of difference in the prices considering what is in them. For this review we're looking only a the better quality offering from Burgess, which is their Sensitive range, and offers good quality ingredients at a very fair price. Don't be too concerned at seeing the word 'Limestone' in the recipe, this is just a soluble form of Calcium, good for bones. 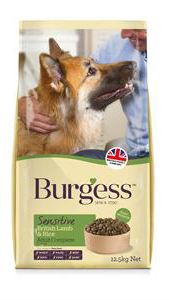 The more basic Burgess products are not a whole lot cheaper but the ingredients are similar to many low cost dog foods. Expect to pay around £30 for a 12.5kg bag of their Sensitive range. Rice (min 26%), Lamb Meal (min. 26%), Unmolassed Beet Pulp (5%), Poultry Fat, Digest, Fish Oil (1%), Lucerne (1%), Limestone, Sodium Chloride.